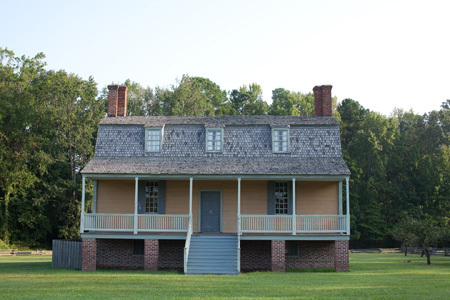 Welcome to Historic Hope Plantation, restored home of former North Carolina Governor David Stone (1770-1818). 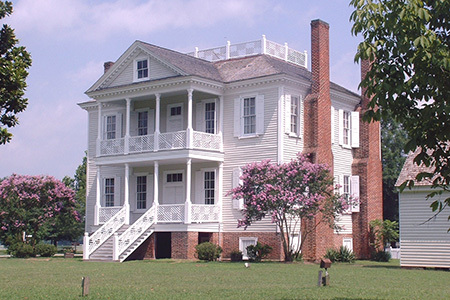 Located four miles west of Windsor, NC, the plantation complex offers unique insights into the late 18th- and 19th-century rural life in eastern North Carolina and the South. The centerpiece of the plantation is the c. 1803 Hope Mansion, Governor Stone's stunning example of an academic architectural combination of Federal and Georgian architecture. Restored and opened to the public since 1972, the mansion is meticulously furnished with an extensive collection of original period pieces. The 1763 King-Bazemore House represents a fine example of vernacular architecture. It is one of the few remaining examples in North Carolina of mid-eighteenth century "hall and parlor" design. The home has been restored and furnished based on the 1778 inventory of owner, William King. The 1763 King-Bazemore House represents a fine example of vernacular architecture. It is one of the few remaining examples in North Carolina of mid-eighteenth century “hall and parlor” design. The home has been restored and furnished based on the 1778 inventory of owner, William King. 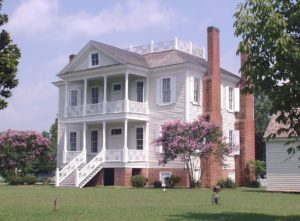 Both homes are on the National Register of Historic Places and are administered by the Historic Hope Foundation, Inc., a non-profit organization dedicated to preserving and interpreting the history of Hope Plantation and managed by a paid staff and board of directors. The site is open to the public and guided tours are offered daily.